Figure 1. This 12-sided crystal recently obtained in Mogok is a rare spinel macle, hosting fascinating multiphase (liquid + gas) inclusions. The stone is reportedly from the eastern part of the Mogok Valley. Photo by Victoria Raynaud/GIA; field of view 5.7 mm. 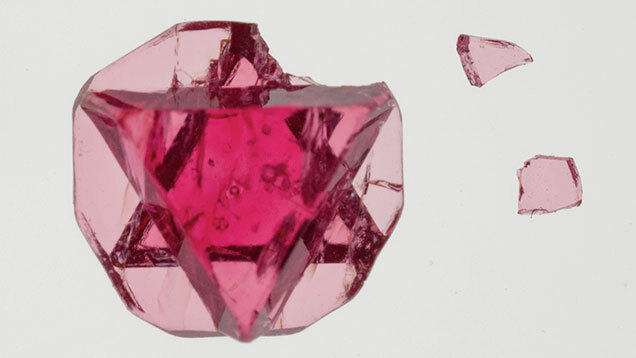 In December 2015, author VP obtained from the Mogok gem market a remarkable spinel crystal with a fascinating Star of David (figure 1). This unusual pattern was formed by two triangles on opposing sides of a central 12-sided polygon. Furthermore, the specimen hosted some conspicuous crystals that resembled fluid inclusions, which are rare in spinel. The stone was reportedly mined in the early 2000s near Pein Pyit, a village in eastern Mogok that is famous for such twinned spinel crystals (T. Themelis, Gems & Mines of Mogok, published by the author, Bangkok, 2008). Hundreds were found in the Mogok market between 2002 and 2004, but most were tiny or broken (V. Pardieu, “Hunting for ‘Jedi’ spinels in Mogok,” Spring 2014 G&G, pp. 46–57). The newly acquired crystal was added to the GIA reference collection. With a chemical formula of MgAl2O4, spinel belongs to the cubic crystal system. It is often found as octahedrons (with o faces), but sometimes dodecahedron d faces are visible. This specimen presents a fascinating case of twinning parallel to the octahedral plane O (111), commonly called “spinel-law” twinning. The general crystal outline is a 12-sided polygon instead of the expected hexagon. If a spinel crystal shows only o faces, a crystal flattened along the (111) plane will appear as a hexagon. But a spinel with both o and d faces that is flattened along the (111) octahedral plane will show 12 sides, as in this specimen. The crystal hosted several fractures as well as interesting fluid and crystal inclusions. Fractures are very common in such thin crystals, causing them to break easily. This specimen broke during the cleaning process (figure 2), and extra care should be taken while handling such crystals. Figure 2. The Star of David spinel hosts some interesting multiphase inclusions. Such fractured, thin crystals are very brittle; this one was damaged during the cleaning process. Photo by Sasithorn Engniwat/GIA. One inclusion was a flat, opaque, and foliated black crystal (possibly graphite) that we could not identify with Raman spectroscopy. There were also carbonate inclusions (identified as calcite and dolomite using Raman spectroscopy). The most fascinating features were the multiphase inclusions; at least eight were located in the center of the specimen (figure 3). They were composed of a negative crystal filled with colorless liquid, hosting a flattened or spherical bubble, filled with a liquid and a gas. This was unlike the features in spinel from Man Sin, where negative crystals are filled with an orange liquid rich in sulfur (again, see Pardieu, 2014). Figure 3. About five multiphase inclusions associated with colorless carbonate crystal are seen in the spinel’s center, shown using diffused brightfield illumination. Photo by Victoria Raynaud/GIA; field of view 2.40 mm. We assumed that the gas inclusions were mainly CO2, as some of the small bubbles disappeared while the stone was under the microscope and gently heated by the well light. This could not be confirmed by Raman analysis; the CO2 concentration in the solution may have been too low. FTIR spectroscopy confirmed the presence of carbonates and oil in some fractures. This might be explained by the common practice (in Mogok) of keeping crystals in oil before selling them. We also studied the sample using photoluminescence and UV-Vis spectroscopy. The Cr3+ band in the PL spectra was approximately 0.89 nm wide. In the UV-Vis spectra, there was a clear absorption in the green around 537 nm. These features confirmed the absence of treatment (S. Saeseaw et al., “Distinguishing heated from unheated spinel,” GIA News from Research, 2009). 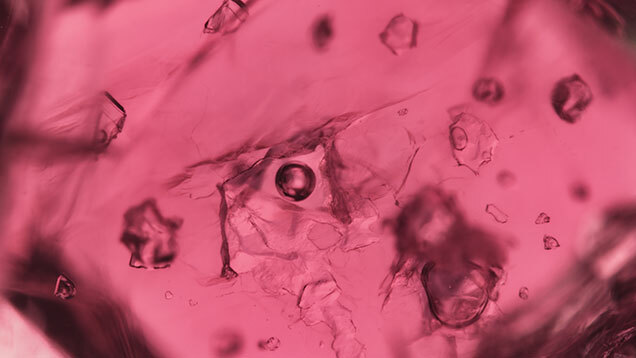 The sample was analyzed using LA-ICP-MS. Three spots were studied and compared to GIA reference data obtained on other red spinels from different origins. The main trace elements observed were V, Cr, and Zn. Other elements (Li, Be, Ti, Mn, Fe, Co, Ni, and Ga) were also detected in lower but still significant concentrations. Based on GIA’s reference data for origin determination, we would have identified these as Burmese, with other localities (Tanzania, Vietnam, or Tajikistan) excluded due to the elevated Zn and Ni content. Star of David spinels are rare crystals that fascinate many gemologists and collectors. Studying these macles promotes our understanding of them and will contribute to origin determination for red spinel. Vincent Pardieu is a senior manager in the field gemology deparment, Supharart Sangsawong is a scientiest, Wim Vertriest and Stanislas Detroyat are trainees in the field gemology deparment, Victoria Raynaud is a trainee analyst, and Sasithorn Engniwat is a stone librarian, at GIA in Bangkok. 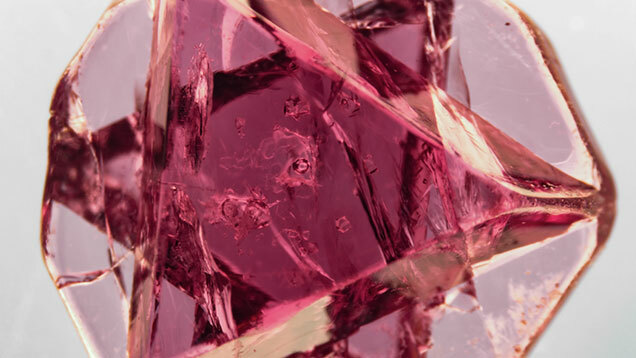 Explore spinel history, research, quality factors, and more in the GIA Gem Encyclopedia. Documents a series of visits to Myanmar in search of exceptionally bright pinkish red spinels possessing no dark tones. While top-quality natural spinels have so far escaped large-scale treatment processes, some heat-treated goods are on the market. This report establishes the identifying criteria of heated spinels.